We round off the term on Thursday 8 December, 2-5 pm, with a round-table in association with the Birmingham Seminar for Environmental Humanities: all are welcome and our speakers are Dr. Marta Musso, Prof. Tait Keller & Dr. Frank Uekotter. e role that hydrocarbons played in decolonisation processes has so far been overlooked by historians. However, the oil industry played a pivotal role in the history of decolonisation, both on an economic level, as basis for self-directed industrial development, and an ideological level, as “the weapon against the West” that Gamal Nasser theorised in 1952 in his pamphlet “Philosophy of the Revolution”. This paper aims to analyse the specific case of Algeria. The Saharan hydrocarbon reserves were discovered in 1956, two years after the outbreak of the hostilities with France; for the French government, it was the occasion to cover its energy deficit and to become a producer country. For the Algerian nationalists, the struggle to gain control over the Sahara became the symbol of future wealth and economic independence. Foreign oil companies, on their part, immediately saw the war as an occasion to penetrate a new market and to seize promising resources. After the independence, building a national oil industry that would directly manage the Saharan hydrocarbons became one of the main goals pursued by both Ahmed Ben Bella first and Houari Boumediénè later. This paper will reconstruct the establishment of the Algerian National Oil company Sonatrach and the entrepeneurs that founded, focusing on the relations between the people running the company and the Algerian establishment, on the one hand, and the relations with the foreign oil industry, namely French and American companies, on the other hand. In particular, the paper will focus on the problem of technological transfer and nationalization in the context of globalized enterprises such as oil companies in producer countries. My paper focuses on how energy geopolitics linked the battle lines and home fronts with industry and agriculture in ways that fundamentally shaped the twentieth century. Few human endeavors have altered the natural world in the modern era as agriculture, industry, and warfare. In 1914, the three formed a violent triad geared for the production of destruction. While battlegrounds seemingly suffered devastation, the resulting damage to nature was normally short-lived. Paradoxically, major environmental change occurred behind the lines, away from the killing fields. Scholars have typically studied armies in the First World War as social entities, but I classify fighting forces as biological systems, which depended on a “military ecology” of energy extraction, production, and supply to function. To maintain the “biological welfare” of soldiers and power engines of war, belligerent countries commandeered energy resources throughout the biosphere. The duration and scale of the conflict altered military ecologies around the world and led to new “material flows” of foodstuffs and fossil fuels. Militarized material flows of energy transformed relationships from global geopolitics down to individual consumption patterns. The presentation discusses the biographical dimension of large infrastructure projects. What are our historical experiences with the men leading these projects? How has the role of the “infrastructure czar” changed since the late nineteenth century? Can we identify distinct national styles of leadership? And what kind of leadership should we expect in the twenty-first century? The presentation provides some insights into a work-in-progress about a collective biography of what Tom Hughes called “system builders”. Our guest blog-post this week comes from Gemma Jennings, an AHRC-M3C funded PhD student in History here at the Centre for Modern & Contemporary History. Gemma’s research examines the impact of the oil industry on gender relations and social structures, adopting a transnational approach focused on Algerian oil, tracing the impacts of this sector through space. Below she reports on an important recent conference at the crossroads of global, political and environmental historiographies. Thanks Gemma! 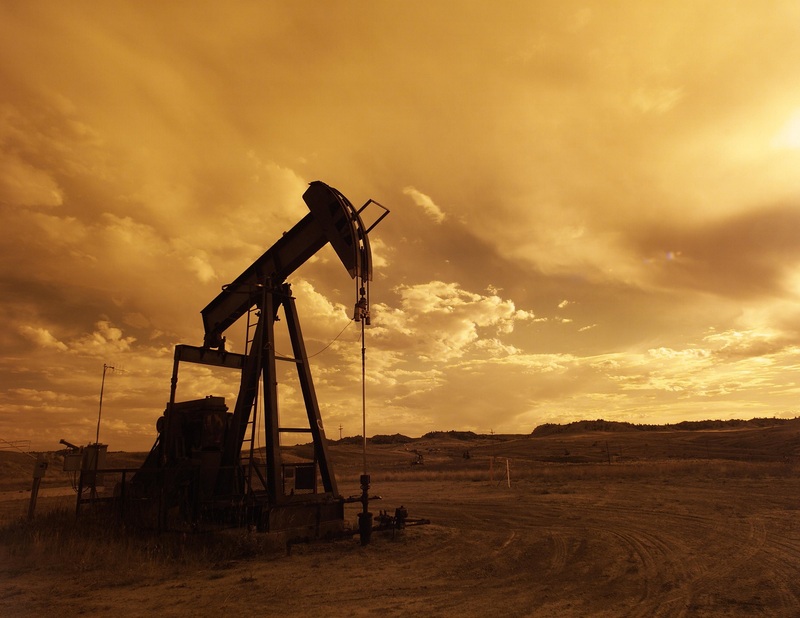 Image: An oil pump at sunset, source. Conference report: ‘Oil Imperialism? Energy and Political Power from a Global Perspective’ (4-5 November 2016, Paris-Sorbonne). Panel One examined oil in the context of empire and international relations. GUILLEMETTE CROUZET (Geneva) presented on the British oil concession in Bakhtiaristan in the early twentieth century, arguing that oil companies operated as ‘agents of imperialism’. The paper illustrated how the policies of these companies created an area that was governed by capitalism and oil technopolitics, transforming local people from ‘dangerous’ tribes into colonial subjects through their employment within the oil labour force. BENJAMIN BENGOBEYI’s (University Paris I-Panthéon Sorbonne) paper, in contrast, elucidated how oil exporting countries have been able to use their oil reserves to counter perceived imperialistic projects, through an examination of Iraq’s approach to the implementation of the Organisation of Petroleum Exporting Countries’ (OPEC) oil embargo against Israel and its allies in response to the Yom Kippur War. VICTOR McFARLAND (University of Missouri), likewise examined international politics in the Middle East, examining the U.S. role in the Persian Gulf in the 1970s, exploring the motivations for and limitations of the American military presence in the region, particularly highlighting the dependence on local partners acting as hosts for the American military. The final paper of the panel, presented by EMILY MEIRDING (U.S. Naval Postgraduate School), returned to British oil interests, interrogating the prevailing premise that the British involvement in the Falklands War was motivated by an attempt to control the Falklands oil reserves. In elucidating the lack of evidence to support this supposition, and highlighting that, conversely, Britain had no interest in this oil, the paper both countered the conception of the conflict as an ‘oil war’ and highlighted the significant influence of ‘oil imperialism’, as a presumed ubiquity, both among contemporary actors as well as in historical accounts. The second day of the conference opened with a panel on oil, anti-imperialism and decolonisation. GIULIANO GARAVINI’s (New York University Abu Dhabi) paper examined the formation, aims and actions of OPEC, arguing that in its opposition to former colonisers attempting to protect their interests within oil exporting countries, the organisation embodied the international dimension of anti-colonialism. ELISABETTA BINI (University of Trieste) adopted a different approach, focusing on the oil workers of Libya from 1960-1980, outlining how the industrial action of these workers challenged the discriminatory policies of American oil companies. PHILIPPE TRISTANI (Agrégé d’histoire, Sorbonne University) then traced how the Iraqi government, despite western opposition, nationalised its oil, arguing that this played a key role in a global ‘décolonisation pétrolière’, mobilising other oil producing countries to nationalise their own industries. KATAYOUN SHAFIEE (UCL London, Centre for Advanced Studies), in contrast, explored strategies employed by oil importers to manage nationalisation, through an examination of the British appeal to international law against the nationalisation of the Iranian oil industry. The presentation argued that, despite the final verdict linking permanent sovereignty to control over natural resources, the strategy of temporisation enabled the British government resolve the crisis to its own advantage. The final panel of the conference looked at oil companies, the state, and the future of oil imperialism, opening with DUCCIO BASOSI’s (Ca’ Foscari University, Venice) paper, which argued that the 1970s ‘petrodollar recycling’ constituted a form of imperialism, due to its direct relationship with the development of an ‘imperial’, globally used, dollar in the 1970s and 1980s. FRANCESCO PETRINI (University of Padua) examined the history of agreements and compromises between oil companies and the U.S. government, arguing that by conflating public interest with the success of their companies, oil businesses were able to leverage deals that tended to favour their interests over those of the state. In the final paper of the day, SIMONE SELVA (University “L’Orientale”, Naples), illuminated how Iranian oil revenues reshaped international capital markets, changing the role of American banks into intermediaries for Iranian international investments. VICTOR McFARLAND (University of Missouri) concluded the conference, outlining that although the range of papers had elucidated the development of ‘oil imperialism’ as a powerful concept in contemporary and historical discourse, the conference had not produced a clear definition of the term, primarily due to its more empirical focus. The geographic delimitation of the conference was discussed, noting that papers had primarily concentrated on oil producers in the Middle East and South America, as well as foregrounding the relationships between western (primarily America and Britain) and producing countries, with less consideration of the broader range of international connections. Finally, the current lack of ‘histories from below’ in this field was discussed, underlining the focus, both at the conference and in wider literature on high politics and economics of the oil industry, highlighting the need to build on and expand the limited studies concerned with individuals and communities directly affected by the industry. 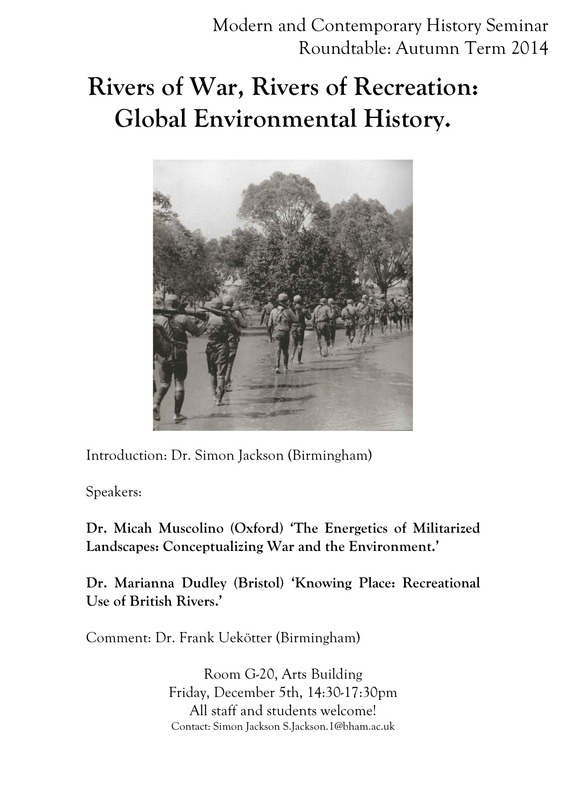 Rivers of War and Recreation: Round Table on Global Environmental History. 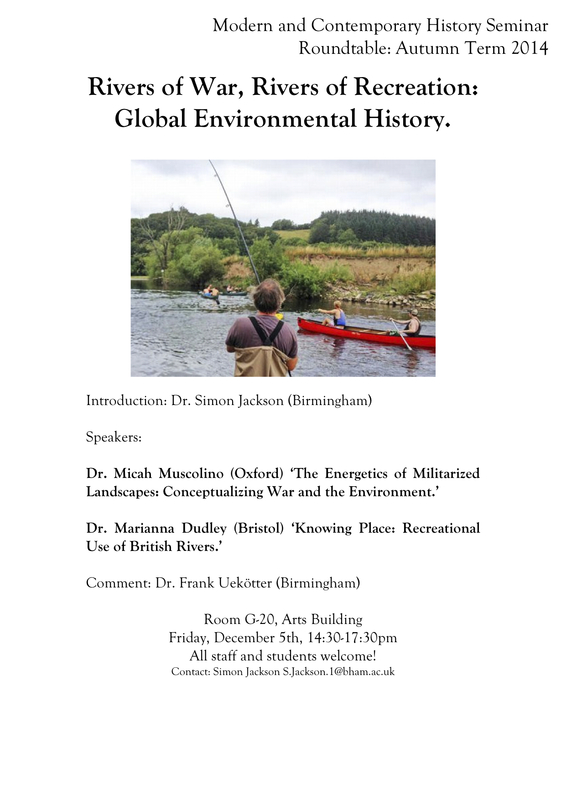 Micah Muscolino (Oxford) and Marianna Dudley (Bristol) will be our guests at this term’s closing Round Table on Global Environmental History this Friday, December 5th, 14:30 in Arts Building G-20. All are welcome. Tea will be served, and the event will be followed by drinks. This paper will explore how different recreational groups have developed distinctive understandings of water and watery environments. By exploring a conflict of use that has emerged through the twentieth century (and continues in to the twenty-first) between canoeists and anglers, it will suggest that recreational engagement with place has produced meaningful, and very different, ways of knowing water that speak to broader academic discussions of water, waters, and the notion of a hydrocommons.